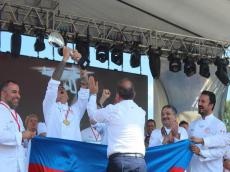 The national team was awarded the first place and the chefs won gold medals and International Culinary Cup. The second place went to cooks from Malaysia, while chefs from Uzbekistan ranked third. Besides, Azerbaijani culinary specialist, member of the National Cooking Association Ziya Shahbazov took part in the congress of chefs in Yekaterinburg (Russia), which was organized by the Maestro center. Within the framework of the event, Shahbazov conducted master classes on the preparation of a number of dishes, mainly from mutton. He also acquainted the participants of the congress with the traditions of Azerbaijani cuisine. The 33rd Mengen International Culinary and Tourism Festival brought together the best chefs from Azerbaijan, Turkey, Jordan, Kyrgyzstan, Maldives, Palestine, Ukraine, Uzbekistan and Malaysia. The culinary specialists competed in the "Black Box" competition. According to the competition rules, each team is given the same black box containing ingredients that must be used to cook three dishes within 20 minutes. Each dish was judged by a 100-point scale. The jury of the culinary competition included the President of the National Cooking Association, the head of the National Culinary Center, the Honored Worker of Culture of Azerbaijan Tahir Amiraslanov, representatives of Turkey, Lebanon, Saudi Arabia, Malaysia, Bangladesh, Serbia, Bosnia and Herzegovina, and Egypt. Earlier, national chefs successfully participated in the third International Culinary Festival Kranjska Gora in Slovenia. Azerbaijani culinary experts Seymur Javadov and Nijat Babayev won gold and silver medals in the class of the National Kitchen Championship. In the class "Modern cuisine" Seymour Javadov grabbed gold, a while Nijat Babayev took silver.